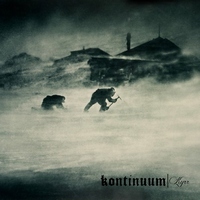 The word “progress” instantly comes to mind when pondering the oh-so-excellent state of Kontinuum’s sophomore album, Kyrr. 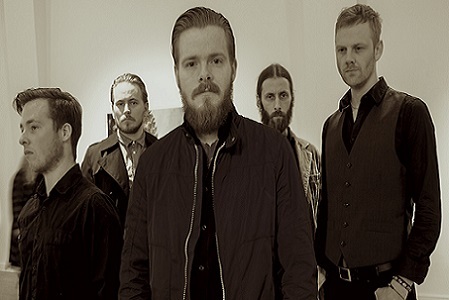 The band’s 2013 Earth Blood Magic debut (Candlelight) certainly had its merit, hunting around in the Icelandic atmospheric metal sphere, strapping on cold, bold melodies, along with a striking post-metal field. Kyrr, however, is far different than its predecessor. Oftentimes stripped to its regular ‘ole rock/metal core, the album finds the five-piece fully engaged in the root-form of songwriting dynamics. One need look no further than the insanely memorable “Í Huldusal,” or “Red Stream” for an understanding of what Kontinuum has accomplished. In essence, they’ve fully transformed themselves after one album, thus, turning in one of the year’s most adventurous bodies of work. Dead Rhetoric.com: It seems like with Kyrr, you’ve made some tremendous strides. Therefore, in your estimation, in what ways has Kontinuum grown since the debut? Birgir Thorgeirsson: It has grown a lot. The songs I feel are much stronger live and we are somehow growing as a band. There is a chemistry growing you can only get with relationship between different individuals, time, work and passion. Dead Rhetoric.com: Per that notion, has the band been more active on the live front? I know you didn’t do a terrible amount of touring, but did the live shows after Earth Blood Magic help shape the new album? Thorgeirsson: We have always tried to be active in the live front. I guess we have had more opportunities lately. The live shows after Earth Blood Magic were essential. We always wanted to do as much as possible to shape ourselves as a band. Dead Rhetoric.com: Somewhat of an obvious question: With Kyrr, was it the goal to make an album far different than Earth Blood Magic? Thorgeirsson: I guess this was inevitable. The lineup has changed and we always wanted, even prior to Earth Blood Magic to have Kontinuum a functional band. Anyone can multitrack an album together. Only a band can capture the live feel and energy you experience in a live show. We want to be that band. One who always delivers extra in their live performances. Earth Blood Magic was written by one guy. It has its pros and cons, but I feel a good functional band will always be much more interesting. Kyrr is an important album for us. It’s our first real collaboration album. We are still free to express ourselves as individuals. People bring their work to the table but things are always digested by the band. Dead Rhetoric.com: The album is more straightforward, but no less catchy. Was there more of a focus on making the song structures a bit tighter this time out? Thorgeirsson: Yes it was. We decided to work with a producer on this album. We stuck to this process all the way. Again, there are pros and cons to take from this but we are glad we did. Dead Rhetoric.com: English versus Icelandic lyrics/vocals. Is there a preference among the band? Thorgeirsson: No not really. We just did what felt natural. Perhaps the first word or sentence in the lyric is Icelandic and then the rest feels it should be too. Personally, I feel very attached to the Icelandic lyrics; they are better and it strikes a richer cord to sing in the same language as your thoughts. English comes also natural to me and it feels more rock ‘n roll. Dead Rhetoric.com: The cover art is stark, yet very fascinating. It looks like some travelers fighting against the elements. Does the album convey that sort of theme? Thorgeirsson: It is not a concept album. Yes the cover describes beautifully how even our hardest moments are also our greatest triumphs. I had some fascination with the mindset of explorers. I felt connected with that mindset. Lyrically, the album deals with struggle of human meaning and why we do the things we do. Similarly, why the explorers risk everything for no apparent reason? What is it that drives us and how we deal with having a cave man brain in a modern day society? Dead Rhetoric.com: “I Huldusal” is perhaps your best song to date. What’s the story behind it? Thorgeirsson: Some might say that. We were very happy with it. It was the first song we did with our producer. After which we decided to do the album the same way. It came to be in a few sessions where all members pitched in. The chorus hook came naturally in Icelandic the very same line. The lyrics then are inspired by the mentality of fishermen in Iceland when they would put themselves in harm’s way on a regular basis just to put food on the table. Dead Rhetoric.com: You’ve been more active on the live front of late. How have the shows been going? And, how is the new material translating? Thorgeirsson: We have been very lucky and nearly always get a positive response. The material is better live in my view. We at least always give it everything and really enjoy playing live. 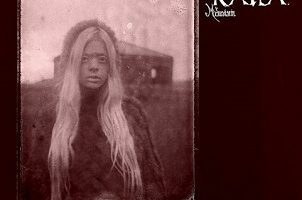 Dead Rhetoric.com: There seems to be (at least from America) this fascination with Icelandic bands. Your scene is small, but very unique. Do you worry the scene will ever get too big for itself? Thorgeirsson: No, I don’t worry. Things have changed in the last ten years. Now, bands are more professional they have more role models that have released albums and played abroad. They know it can be done, but only if you are unique. Since you can’t really plan a local career as an original musician, you are very much aware of the importance of standing out. Trying to be different from the others. Of course this mentality is not purely Icelandic, but it’s overwhelmingly important here just due to the size of Iceland. You have to get the attention of foreign ears if you want to do anything interesting in music. Dead Rhetoric.com: Somewhat of a non-related question: What’s the status of Potentiam? And, has anyone ever told you how great a song “Chameleon” is? Thorgeirsson: Ha-ha thank you. I always liked that song. Well we still have a record in the pipeline. I think it’s a good one. We have just all been busy in different things. It is no longer the main band for anyone. We will still release this album. Perhaps we will find the time in the near future but I have stopped giving any dates out. Dead Rhetoric.com: Finally, what’s on the agenda for the rest of 2015? 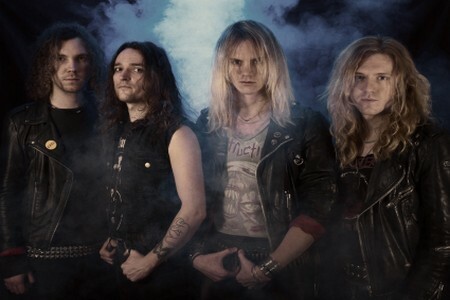 Thorgeirsson: We have a support for Mastodon which are playing in Iceland in December. Then we have Iceland Airwaves music festival. Other than that, we just came from a small tour with Grave Pleasures and will be sorting out our contract issues before diving into writing mode for the next album. We have exciting times ahead and a lot of unwritten music in the skies.